The LEAP engine incorporates a composite fan. The LEAP engine is a product of aircraft engine supplier CFM International, which is joint venture between Snecma (Safran group) of France and GE, USA. AEC is currently working with Snecma to develop fan module components for the engine. The LEAP fan blade is a new composite technology patented by Snecma. Rather than being built with multiple layers of composite plies, the LEAP blade is woven in three dimensions, moulded into shape, then injected with resin in a resin transfer moulding process (RTM). The blade will require minimal maintenance. AEC has been instrumental in designing the fibre architecture for the composite blades and is responsible for their manufacture, which includes weaving fibre preforms and moulding the composite parts. The preforms in these blades are fabricated using automated 3D weaving processes. The 3D woven architecture provides a structure that is highly damage tolerant and able to withstand significant in-plane and through thickness loads. Additionally the automated process is more reliable and cost effective than a comparable laminated composite blade, as less manual labour is required to fabricate the blade. The Farnborough International Airshow takes place on 9-15 July in Farnborough, UK. AEC is also producing a composite fan case. AEC has a long history using single-layer 2D woven aramid (Kevlar) contour woven fabrics for fan case containment fabric. The LEAP composite fan case is unique in that it combines AEC's 3D and contour weaving capacities to produce near-final net shape preforms, which are then moulded to shape using RTM. Using contour weaving allows the entire fan case preform, including flanges, to be formed as a single preform without the need for cutting and darting, while the continuously woven nature of the part eliminates fibre buckling after moulding. According to AEC, a composite fan module (comprised of blades, platforms, spacers, and fan case) is 300 lbs lighter compared to equivalent metallic components per engine. 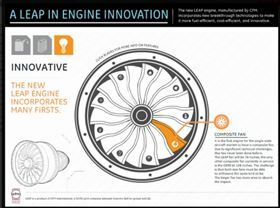 According to CFM, the LEAP turbofan is the first engine for the single-aisle aircraft market to have a composite fan. The LEAP fan will be 78 inches. Since RTM technology enables more complex and efficient shapes, the LEAP fan will have 18 blades compared to 24-36 blades today. Complete with a composite case, the fan will save 1000 lbs per aircraft compared to the same size fan using metallic components. This new turbofan will run on up to 16% less fuel and emit 16% fewer carbon dioxide (CO2) emissions, compared to today’s best CFM56 engine and depending on certification timing. It will also be much quieter than current CFM56 engines. The LEAP’s launch aircraft is the Commercial Aircraft Corporation of China’s (COMAC’s) 168-190 passenger C919 narrowbody. This will be the largest commercial airliner ever designed and built in China. Its first flight is expected to take place in 2014, with initial deliveries scheduled for 2016. As of May 2012, LEAP orders and commitments measured to more than 3500 engines. It is one of two engine options on the Airbus A320neo and the exclusive engine for the Boeing 737 MAX and COMAC C919. Albany Engineered Composites, a subsidiary of Albany International Corp, is headquartered in Rochester, New Hampshire, USA. Beyond these spaces, AEC is currently expanding its production facilities to support the LEAP programme. This expansion includes new production plants in Rochester and Commercy, France. AEC and Snecma will be co-located in both facilities. Construction of the Rochester plant – a new 353,000 ft2 facility designed for LEAP composites product manufacturing – is currently underway. Construction of the second plant in Commercy, France, is scheduled to begin later in 2012. VELOX GmbH is working with AEC Polymers to develop new solutions for the marine sector.